This is the final installment of our April Blogging Challenge. Thanks so much for staying with the four of us. It's been fun but we are all ready to move on to blogging only when we feel like it. 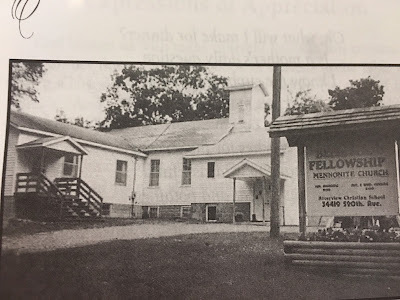 Last Saturday I spoke at a luncheon at Bethany Church of Franklin, a lovely little country church south of Cheshire that reminded me so much of the little church in Minnesota that we attended and where Dad still goes. Both were originally Methodist churches and built in the 1800s, so maybe all the little rural Methodist churches of that era were built to the same pattern. the members divided over methods of baptism. but you can see the original church and steeple in the center. Another similarity was that they both had one big room in the basement that was always subdivided with curtains for Sunday school. However, the basement of the Oregon church always flooded in winter. That bit of history has nothing to do with this post, but the lovely luncheon ladies had a bunch of questions for me and wanted updates on various things. The questions were almost identical to the ones they asked at the retreat in Montana a few weeks ago and at Emmaus Lutheran a few weeks before that. 1. I hear the Register-Guard was sold. What does that mean for your job? The RG has gradually let go of its freelance columnists, one by one, over the last ten years-- Maryana Vollstedt the recipe columnist, Bill Sullivan the hiker, and others. Recently, after being in the Baker family for 91 years, the RG was sold to GateHouse Media, and I think about a third of the employees were let go. I asked my editor what this means for me, and she said she hasn't heard, and that I should keep writing until I hear otherwise. I don't like the uncertainty of this, and I've been thinking a lot about how long I should continue the column if they don't lay me off first. On one hand, it's great to have an established venue and deadlines, so I actually get something written. On the other hand, it's been 18 years. That is a really long run. Our children—otherwise known as my reliable story generators—are all grown up. Maybe it's time. The ladies at Saturday's luncheon said they're going to write to the paper and tell them to keep me on, which is great for job security. 2. How many kids are still at home? At the moment, the three girls are at home. Amy came home last fall after almost four years in Thailand. She and Jenny are in college. Emily is working at our church school. As for the guys, Matt is still in Washington, D.C., Ben lives in Corvallis, and Steven lives at the fire station in Junction City. 3. How is the daughter that was sick for so long? That would be Emily, whose health is still a bit fragile but who has powered through and made a very good life for herself and figured out how to work around her energy limitations. 4. What's happening with that cabin? Paul has gradually been restoring and installing windows and doors. Before the windows were in, he covered the openings with plastic, so I was able to heat the cabin and work out there a lot this winter. I really really [really really!] like it. There's something about having a dedicated space for writing that makes you sit down and WORK without getting distracted. These days, in addition to about four new building projects at the warehouse, Paul is working on the floor of the loft, putting in the wood that used to be above the bagger at the warehouse. He's trying to preserve the famous footprint, so that will be special. After that, he'll put the pretty restored old wood on the "downstairs" floor. 5. What about that novel? La la la LAAA I CAN'T HEAR YOUUUU. Oh look! Squirrel! 6. Has Steven been back to Kenya? Not since 2011, but we would all love to go back for a visit and he would like to go back to work there someday. No specifics yet. 7. Whatever happened with that incident where you were out chasing chickens in pajamas and a guy in a truck was taking pictures? The pictures never showed up on social media or anywhere else, thankfully. It turned out that if you type a certain neighbor's address into Google maps, it actually points you to our place. So it might have been a case of mistaken identity. 8. How is your dad doing, and is he coming out for the summer? Dad/Amos is 101 years old and by all reports has had a good winter. My sister Rebecca just spent a few days with him and took him up to Duluth to see the sights. At this point we don't plan to have him come to Oregon this summer. He was getting so fragile, and I think he needs to stay home. But we'll probably go visit him. 9. What's happening with all your fabric? And just how much is "a lot"?? I'm not ready to divulge just how much fabric I own. Actually, I have almost as much as ever despite doing a bunch of sewing the last couple months. However: If you want to see an unspecified percentage of my stash, come to the Halsey yard sales this Saturday. I'm going to borrow a friend's garage at 1320 West 4th Street and I will offer a "lot" of fabric for sale. Please come buy it. 10. Do you have other writing projects going on? Articles, yes, here and there. Books, no. But I have a few ideas percolating. Ben: What have you been cooking recently? Steven: I made honey mustard chicken last night. Ben: Did you use butter or bouillon? Steven: Actually I used both! Ben: That's actually better. Last time I separated out the fat afterwards and used it to make grilled cheese sandwiches and to put on bagels. Ben: Yeah. It's got some curry in there…it's actually pretty good. Mom: [thinks] My boys are talking about cooking!!!!!! Dorcasm I was going to ask about your fabric stash. I'm almost done reading Fragrant Whiffs of Joy and nearly fell over laughing because I have a huge fabric stash. I'm glad to see that your dad is still here. When is his birthday? His birthday is November 26. Oh my goodness Dorcas! Is there anyway I can edit my first comment? I made an extremely embarrassing typo! Because I was originally going to type "Dorcas, my fabric stash" and I forgot and didn't notice what I did! LOL and it's ok--we all make typos. You should be able to edit it if you're signed in. I can only delete it from my end. What is a lot of fabric? I had to laugh because years ago an uncle of mine said about my aunt (my father's sister) "You know how our church leaders have counseled us to have a year's supply of food? Well my wife has a hundred year's supply of fabric!" It must be that our imagination and desire overestimate what we can accomplish in reality. I have lots of fabric also, despite using it up and giving it away. I wonder if it breeds in the night. I hope you sell lots this Saturday. Thanks for sharing these Q&A's. I hope you don't mind that I think of you as a friend. You are a wonderful woman and I sure enjoy your writing. That's funny because I too have thought that we could be under siege for a long time and still be well clothed from my stash! About the novel...do you actually WANT to write a novel? As a (more or less) writer myself, I get kind of frustrated with the idea that the pinnacle of every writer's dream is to write/publish a novel. I don't write fiction. I write poetry from time to time, but I am most passionate about...well, let's just say, "other genres" of writing. Which is not to say you shouldn't dream of writing a novel if that's your heart's desire... Just remember that the writing you do now--writing about your every day life--is wonderful and valuable, and SO well done. Thank you for your wise words. The truth is I absolutely love a good story and I would really like to write a story that I would find as satisfying as The Blue Castle, for instance.